THE MOST COMPREHENSIVE RANGE OF MOBILE BUFFET EQUIPMENT ON THE MARKET. THE PERFECT CANVAS FOR THE AMBITIOUS HOTELIER WHO WON'T SETTLE FOR COMPROMISES. 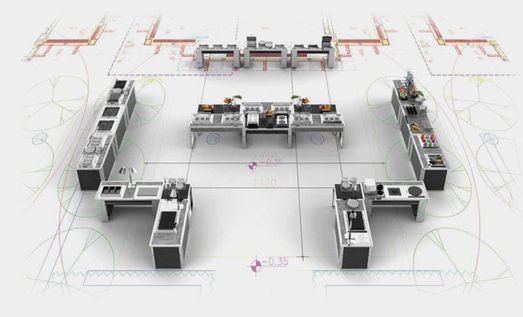 The Modular Line is a system of products that, as a result of their interrelatedness and compatibility with one another, can be configured and re-configured in endless ways to meet the constantly changing needs of any style of foodservice faced by the hospitality industry. The Modular line captures the essence of modern banqueting and catering foodservice. It is adaptable, stylish and interactive. At the heart of the Modular Line is our Dynamic Built-In Modular System (DBMS), a technology patented by La Tavola®. 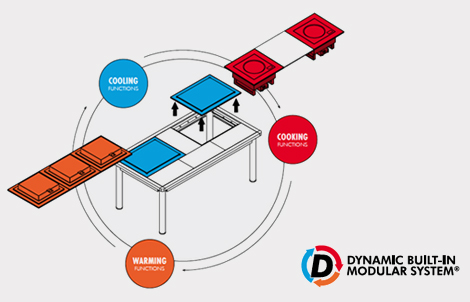 The DBMS is a very clever yet simple mobile frame that allows you to incorporate any of La Tavola’s functions for warming, cooling, cooking, mixology and ambient temperature display into any one of our tables. This is how we have created a system that knows no boundaries. With over 70 warming, cooling and cooking functions available, the Dynamic Built-in Modular System gives La Tavola’s buffet stations total versatility. Extend your warming, cooling and cooking functions. Take advantage of our in-house consultants' expert know-how to create a stunning, mobile, fixed or semi-fixed buffet set-up. Buffet layout & blueprint study. Enjoy our proposals in the form of a customized 3D proposal. Are you interested in Action stations?